Give away a piece of your heart with our Frozen Pudding Heart Dessert. 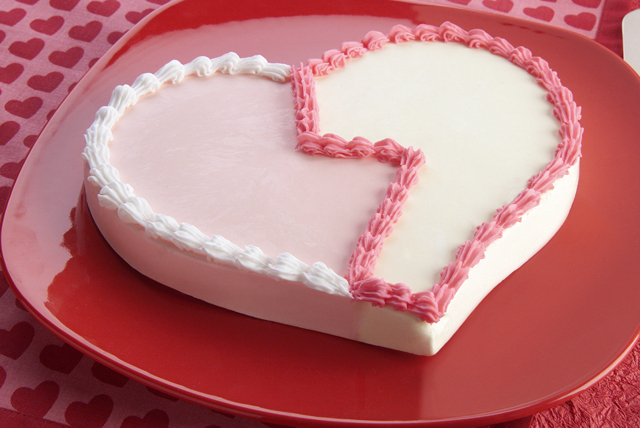 This two-tone Frozen Pudding Heart Dessert is easy to make and quite sentimental. Place folded aluminum foil strip as divider down center of heart-shaped mold. Pour milk into medium bowl. Add dry pudding mix. Beat with wire whisk 2 minutes. Gently stir in whipped topping. Pour half of the pudding mixture into one side of mold. Add enough red food coloring to remaining pudding mixture to tint it desired shade of pink; pour into remaining half of mold. Carefully remove foil. Freeze 4 hours or overnight until firm. Unmold onto serving plate. Decorate with icing as desired. Store leftover dessert in freezer. Prepare as directed, using JELL-O White Chocolate or Cheesecake Flavor Instant Pudding. Makes 7 servings, 1/2 cup each.